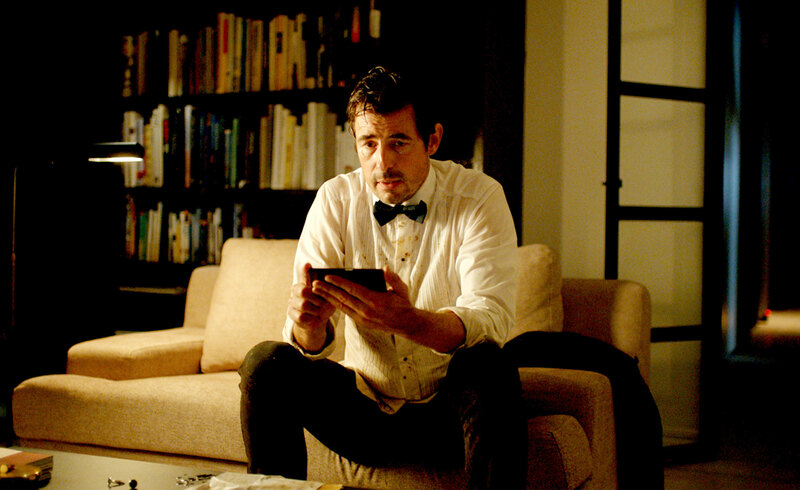 When I tell you that the main character in The Square, Christian (Claes Bang), the Swedish chief curator of a Swedish museum of modern and contemporary art, is played by a Danish actor who speaks Danish throughout the entire film when he is not speaking English (everyone else is speaking Swedish and English); this should serve as an indication of the provocative, off-beat, dry humor of director Ruben Östlund’s very dark and enigmatic comedy. Christian—yes, it’s a coded name—is the divorced father of two spoiled pre-teen girls, who is devoted to countering the power of modern consumerist commercialism by supporting free artistic expression in Sweden. He maintains a policy of democratic inclusiveness in the way he exercises power at his chic museum, and is staunchly determined to be a nurturing male presence in the lives of his daughters. 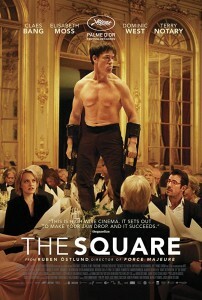 The film begins as Christian is launching an exhibition called “The Square,” which is composed of a literal square configured on the ground bearing a plaque that reads that it is “ a sanctuary of trust and caring,” inside of which “we all share equal rights and obligations.” What could go wrong? Through Christian, Östlund explores the nature of art, the relationship between art and life, but most of all whether human nature is wired to fulfill the ideals of openness and inclusiveness that The Square embodies, a question that is particularly sensitive, painful, and timely as we battle the duly elected (?) fascist who is now in the White House. As Christian is on his way to the museum, on a crowded Stockholm street, he stops to help a woman screaming hysterically that the man chasing her intends to kill her, and maybe Christian too. Only one other man pays attention to the woman, and, after both the woman and her ostensible attacker disappear, Christian and the other man comment on the strangeness of this start to their day. As Christian resumes his progress toward work, he realizes he has been conned and robbed. Neither Christian nor we know just who was involved in this operation. Was the man Christian seemingly joined with the help the unknown woman part of the con? Possibly. What we do know is that no one stops to help Christian when he asks for help after this strange, brief encounter. We next see him at work, where a pair of young trendy, chic marketing men sell Christian on a marketing campaign that will attract public attention through unorthodox means. In their seeming assertion of freedom of speech and expression, one of Christian’s ideals, as they talk about how they will serve the museum, they strike us as another version of the apparently sincere and real con artists who took advantage of Christian’s other dominant ideal, helping and caring for all members of society. As the film unfolds, Christian plots with one of the young men who works for him at the museum to reclaim his stolen property. Using modern technology, they trace his cell phone’s GPS signal to an apartment house in a working class neighborhood, where they are sure the thief lives and distribute flyers to each apartment that threaten and excoriate the unknown perpetrator, but giving him/her a way of returning the wallet and cell phone anonymously, no questions asked. At the same time, the two marketers present Christian with a plan for a campaign that will distribute a shocking video on YouTube about “The Square.” They pitch a video in which Sweden’s most vulnerable are personified by a blonde, child beggar who enters The Square of caring and trust, only to have something completely unexpected happen, something, they say, that will be the opposite of the meaning of the exhibition. They don’t specify what the unexpected event will be, but a distracted Christian gives them the green light. Christian’s privileged life of affluence, beauty, and power collapses in the aftermath. His wallet and cell phone are returned. It seems that the tracing of the GPS signal did yield a definitive result. And so does the YouTube technology. The video gets an enormous public response. But in both cases success is failure. Christian can never win no matter what he does, because, as this film tells us, human nature is too ambiguous and society too ambivalent for anything but chaos to result from action no matter the intentions of intelligence behind it. The successful flyer that Christian distributed also had an unintended consequence. A young teen-aged boy (Elijandro Edouard) who lives in the apartment house, clearly from an ethnic minority, an immigrant, not an inheritor of the power elite to which Christian belongs, was accused by his parents of being the thief when they received the note Christian put into the mail slot in their door and the boy doggedly stalks Christian for an apology. The film never lets us know whether the child is filled with hurt pride or whether he is a hot head looking for a fight. We don’t even know if he was the thief. But we do know that Christian is torn by an unresolved and perhaps unresolvable succession of contradictory emotions because of the boy that run from outrage, through violence, to guilt and sympathy. He rids himself of the boy and his aggression, but this too is a mixed blessing. When Christian undergoes a reversal and feels compelled to give this poor child the apology he requested, the boy is nowhere to be found. Running parallel is Christian’s discovery that the YouTube video he offhandedly approved depicts the tiny blonde beggar child walking into “The Square,” holding a kitten, and being blown up by an explosion, as the video inter-titles asks how much inhumanity the public needs to be shown to touch public humanity. The video we see is grotesquely simplistic in its manipulations, a study in raw button pushing that would be hilariously funny in its crudeness if it didn’t push our buttons so effectively. Public outrage is swift and extremely damaging to Christian. But I won’t tell you precisely what happens and what the film suggests about what Christian’s life is in the process of teaching his privileged Swedish daughters. I hope you will take a look at this intriguing film for yourself. Christian’s journey is punctuated by a mocking little tune on the soundtrack, played on something that sounds like a kazoo, and Elisabeth Moss and Dominic West are on hand as Americans whose absurd understanding of freedom of expression implies the influence of the United States on the modern version of chaos. There is also an extraordinarily anomalous museum fund raising banquet in the ballroom of a sumptuously elegant hotel, bathed in gold light, that underlines the conundrum of the modern civilization just before the YouTube video becomes known to the museum’s rich benefactors. The entertainment for the evening is a performance by Oleg, the ape man, (Terry Notary), naked from the waist up and making hooting simian noises, who is either intended to be an actual animal/human hybrid, or an actor who has lost the boundary between performance and reality. “Welcome to the jungle,” the benefactors are told as Oleg enters the rarefied region of the socially privileged. Jungle it turns out to be when Oleg attacks individual guests while all the other guests turn their heads away from the predator as if avoidance will shield them from Oleg, until Oleg becomes so extreme that the men in pristine tuxedos unleash a tidal wave of violence on him. The puzzle of civilized life is brilliantly portrayed here and throughout the entire film as an overwhelming mystery. 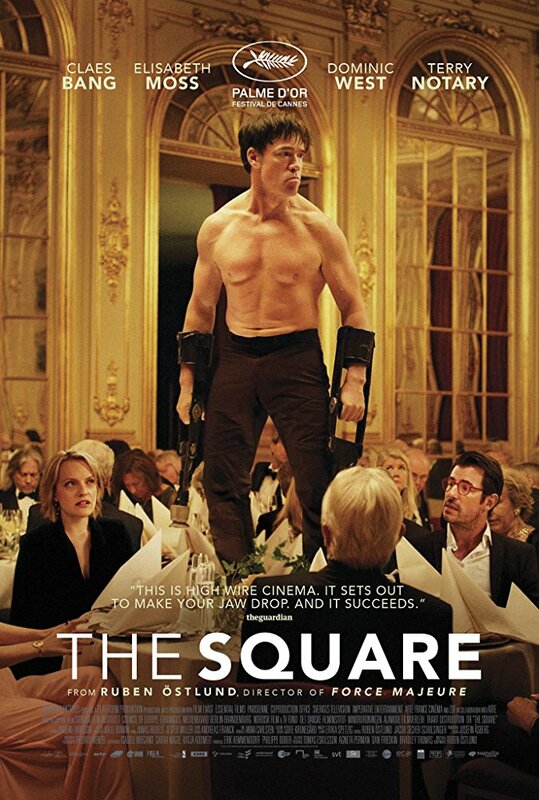 The Square was shown at the New York Film Festival in 2017 and won the Palme D’Or at Cannes. Its most bizarre, surrealistic scenes—yes, including Oleg and the pickpockets Christian encounters at the beginning of the film–are based on real events.